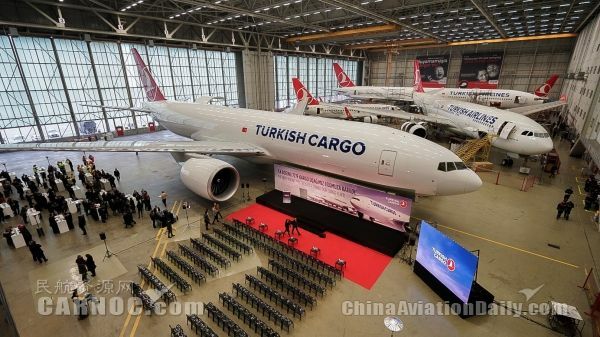 Boeing and Turkish Airlines Celebrate the Airline's First 777 Freighter__Commercial Aircraft Corporation of China, Ltd.
Boeing and Turkish Airlines celebrated today the delivery of the airline's first 777 Freighter. It's the first of two 777 Freighters, Turkish Airlines has on order for this year. "The delivery of our first 777 Freighter is a milestone event in our cargo business," said M. İlker Aycı, Chairman of the Board and the Executive Committee of Turkish Airlines. "As a prominent sub-brand of Turkish Airlines, Turkish Cargo increased its freighter destinations served from 55 to 73 from the beginning of this year, reaching to approximately 1 million tons of cargo with %29 percent increase compared to the previous year' same period. It is surely beyond doubt that this a remarkable success. We're sure that this significant delivery which will bring great value to our rapidly growing cargo operations will also enable our leading sub-brand to further compete, expand and reach new short and long-range destinations from our hub in Istanbul." Based in Istanbul, Turkish Airlines is one of the fastest growing and prosperous airlines in the world. It carries over 60 million passengers a year, with direct flights to 300 destinations in 120 countries. The airline made its first domestic flight in 1933 and the first international flight in 1947. Turkish Airlines was founded in 1933 with a fleet of five airplanes that carried a total of 28 passengers expanding to 329 aircraft the airline operates today. Counting the 170 aircraft on order, and the aircrafts whose rental periods are due to come to end by the end of 2023, the fleet of the carrier including cargo aircrafts expected to reach 500 aircraft, which is also an important objective of Turkish Republic's 2023 Vision that laid down to coincide with the 100th anniversary of the Turkish Republic.